Leading loyalty reward specialist Loyalty Pro is celebrating after issuing its millionth purchase transaction. 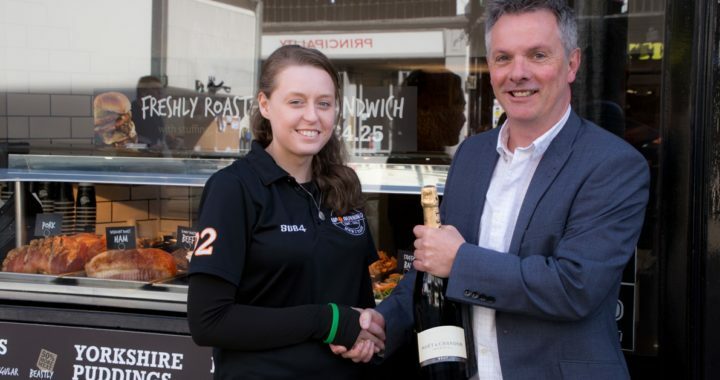 Shop assistant Hannah Stanley, who works at sportswear shop Up & Running in Chester, was the company’s millionth customer. She said: “I’d just nipped into York Roast to buy a turkey stuffing and cranberry sandwich and when they swiped my loyalty card, a message popped up on screen and the manager told me there was a nice surprise for me. I thought it was a joke at first until Rob from Loyalty Pro presented me with chocolates and a bottle of champagne. 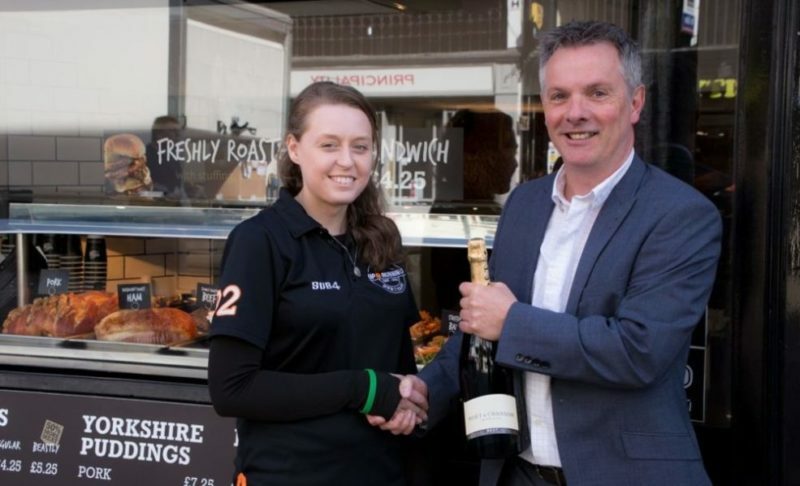 Rob Meakin, Technical Director of Loyalty Pro which is based in Deeside, said: “York Roast wanted a loyalty scheme to better engage with their customers and which could grow with them as they opened new sites across the country. “We worked closely with them to deliver their ‘Love Roast, Love Locals’. The system allows York Roast to leave messages for individual card holders which display when the card is next used. So we were able to drop a message on to Hannah’s card. York Roast serves freshly roasted hand carved meat sandwiches, Yorkshire pudding meals and refreshments to eat in or take out. It has outlets in York, Chester, Kingston-upon-Thames, Shrewsbury and Salisbury. Wayne Chadwick, MD of the York Roast Company said: “We are a fast growing business and it’s crucial for us to be able to engage with our customers and build a database so that we can continually promote to them. Loyalty Pro is a great system and the team behind it is very responsive.